The Panasonic NI-E200T is a consistent online best-seller. It has an extremely affordable price even though it comes from one of the most familiar and reputable names in consumer electronics. Its most distinguishable feature is its U-shaped titanium sole-plate. This is one of the most affordable irons you can find from this brand. Despite its price, the Panasonic NI-E200T performs very well. It heats up quickly and will not stick to your fabrics. One of the biggest shortcomings is the lack of automatic shut-off capability. This is not a model for the forgetful. It lacks the power to provide the same heat as a model like the Rowenta DW5080. To get the same results, more pressure would need to be applied. 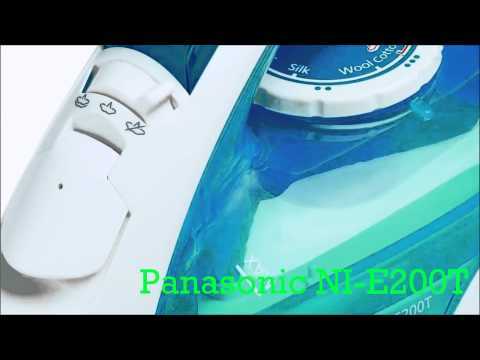 The Panasonic NI-E200T iron features a unique titanium sole-plate with a non-stick coating to prevent your iron from scorching your fabrics. The plate is made with a U-shaped design in order to distribute pressure evenly across the iron instead of just the tip. The shape of the titanium iron also facilitates proper circulation of the unit’s steam. There are steam ports around the edges of the sole-plate, and the steam can be controlled via a switch near the handle. The settings include dry, low and high. The NI-E200T is much like the Panasonic irons NI-E300TR and NI-E650TR. All of these models feature the same sole-plate design and body size. The main difference is their price tags, and the NI-E200T is the most affordable of them all due to the fact that it lacks many of the more advanced features found on those models. This Panasonic steam iron is just a basic unit offering the necessities. It features a temperature control knob that allows you to choose among 5 different fabric settings. Its power cord rotates 360 degrees to give you freedom of movement, and it’s 8 feet long to allow better reach. The water tank on the Panasonic NI-E200T can hold 7 ounces, and it has a translucent blue design. The only significant reasons to pass up on this budget-friendly iron is the lack of automatic shut-off and self-cleaning features. If you use such features commonly on everyday ironing tasks, this may not be the model for you. If you can get on well without them, this Panasonic iron’s price tag makes it a definite model worth considering. The Panasonic NI-E200T iron is very affordable, and it has a decent quality for its price. There are hardly user complaints for leaking or other common issues you would normally find for a unit of this price. It is suitable for anyone not looking for fancy features and frills.